Find a Adventure trip that explores Middle East. There are 420 tours to choose from, that range in length from 3 days up to 29 days. The most popular month for these tours is September, which has the most tour departures. "I loved the wadi rum jeep desert tour. 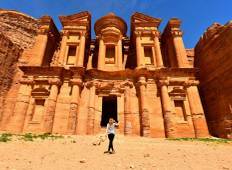 Maybe you could add an overnight stay in wadi..."
"Jordan is amazing, Petra in particular is wonderful and we chose this tour as it..."
"Great tour to see most things in Egypt." "Was a fantastic tour. Metin really engaged with the group and made everyone feel..."
"It was a great experience, the tour guide was excellent and really helped us to make..."
"Metin was such a great tour guide ! So knowledgeable and made it interesting and..."
"Overall the tour was fine, Kibbutz didn't see much, disappoint a bit."